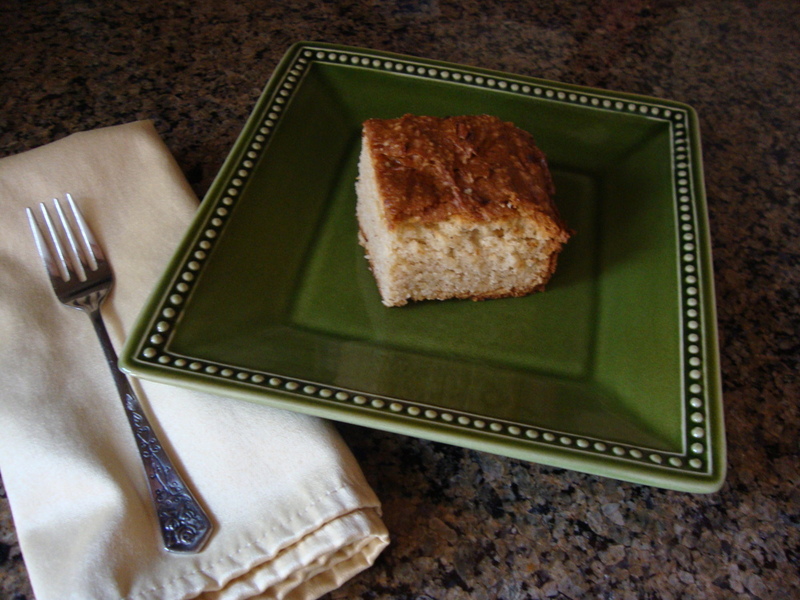 I adapted this recipe for a gluten-free Apple Spice Cake from the August/September issue of Living Without (www.LivingWithout.com). See my post of May 5, 2011, for more on this great magazine. Instead of baking it as a layer cake, I used a Wilton (www.wilton.com) 13x9x2 sheet cake pan so that the cake could be cut into squares, as shown in the photo. We chose not to frost the cake but you certainly could. See Page 47 of the August/September issue of Living Without for the original recipe, which describes how to make this as a layer cake with frosting. As a sheet cake, this serves 15 people; it would serve even more if you cut the slices smaller than what’s pictured. **As the magazine suggests, heading to the orchards to get fresh baking apples—as they are tart and sweet--is the way to go. Roughly speaking, 4-5 average-sized apples yields three (3) cups of grated apples. Preheat oven to 350 degrees. Grease a 13x9x2 cake pan. In the bowl of an electric mixer, beat eggs, oil and sugar at medium-high speed for three (3) minutes. Mixture will thicken and appear pale yellow. On a piece of waxed paper (I used a separate mixing bowl instead), sift together the flour, baking soda, baking powder, cinnamon, nutmeg, salt and xanthan gum. Add the dry ingredients to the wet batter and mix on medium-low speed just until blended, approximately 30 seconds. Squeeze grated apples between paper towels to remove some of the juice and add apples to mixture. Blend just until smooth. Spread the batter evenly in cake pan. Place in preheated oven and bake for approximately 1 hour to 1 hour and 15 minutes. (Time will vary depending on oven and pan size.) Cake is done when an inserted toothpick comes out clean. * Let cake cool in the pan for 20 minutes. Slice and serve. Dust with powdered sugar if desired, or serve warm Apple Spice Cake accompanied by a scoop of vanilla ice cream! *In my 13x9x2 pan, the cake was done after 1 hour.